1. Run a traceroute from your commandline and from an independent site. 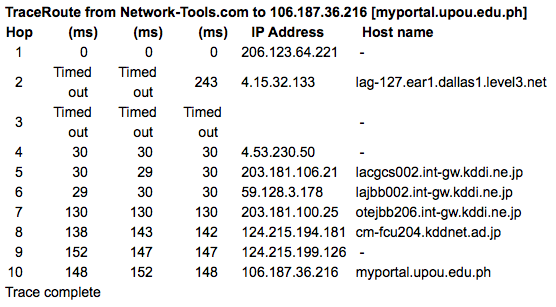 In both cases, the traceroute instances suggest that MyPortal is reachable. In the event that your local traceroute fails but the one from third-party works, please report the issue to your local Internet service provider (ISP). 2. Change your computer's DNS. It's possible that your local ISP's DNS (Domain Name System) is acting erratically. Change it to some reliable DNS like Google's (8.8.8.8 or 4.4.4.4) or those (208.67.222.222 or 208.67.220.220) from OpenDNS. DNS is like the phone book of the Internet. It keeps track of website names like myportal.upou.edu.ph. 3. 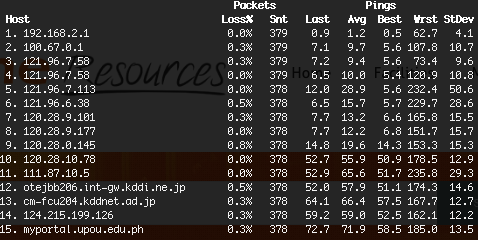 Help trace possible packet loss with MTR. 4. Test your site's DNS. Diagnostic sites like Pingdom can help your administrator figure out the issue. Report if you find anything strange.